If a Star Wars film a year isn’t enough to satisfy your appetite for a galaxy far, far away, perhaps taking the mantle of a Jedi will. 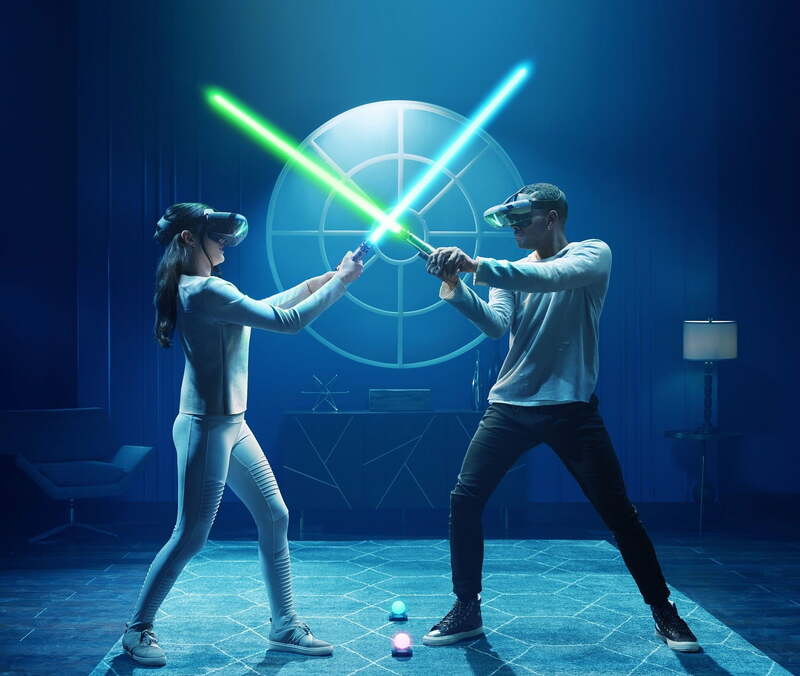 Disney and Lenovo have teamed up for Star Wars: Jedi Challenges, an augmented reality game where players wield a lightsaber to fight enemies like Kylo Ren, partake in multiplayer lightsaber battles, fend off blaster fire from Stormtroopers, and play Holochess. All that is possible with Mirage AR, a Lenovo-built headset that uses your smartphone to power the experience. Update: Disney has pushed out a new game mode for Star Wars: Jedi Challenges called “Lightsaber Versus Mode” that allows you to duel someone who also has the headset and lightsaber. The update is available for iOS and Android, and we’ve added more details about the new game mode below. The packaging for Star Wars: Jedi Challenges looks like it can fit a full desktop computer. There are a lot of components, so if you bought this for a child, you may want to spearhead the setup process. Inside the box is the Mirage AR headset, a lightsaber controller, a tracking beacon, a MicroUSB charging cable for the lightsaber, and two AA batteries for the beacon. You’ll also find three MicroUSB cables, each with different ends — MicroUSB, Lightning, and USB Type-C. You have to connect a smartphone to the headset, so these options help ensure you can connect your phone, whether it’s an iPhone or an older Android phone. You’ll need to make sure your phone is compatible with the game before you buy the headset. Lenovo told Digital Trends that most phones dating back up to three years should work, including an iPhone 6. Ideally, you’ll want a high-end phone, considering the game is heavy on graphics and can also run hot after a lot of gameplay. We tried to use the new HTC U11 Life smartphone, but found it’s the one of the few phones that will not work with the game, largely because the placement of the charging port is on the bottom right edge, rather than the traditional bottom center. We ended up using a Google Pixel 2 XL, but it does work with phones like the Moto Z2 Force (Motorola is owned by Lenovo). The first thing you’ll want to do is head to the Google Play Store or Apple App Store and download the Jedi Challenges app. Once installed, open it and begin following the setup prompt. You’ll find the option to choose between playing solo or multiplayer. Choose one, and you’ll be asked to turn on the lightsaber controller (the switch is on the bottom), and the phone will connect to it via Bluetooth. You’ll then need to calibrate it by pointing it parallel to the ground and making an infinity sign. Then you’ll need to place the tracking beacon on the ground (make sure you have a spacious room), and your phone will pair to it. On the left side of the headset is a flap you can open. Pull out the tray that’s inside — this is where your phone will sit. Continue following the setup instructions, but we recommend choosing the appropriate MicroUSB connector and plugging it into the headset, and plugging the other end into your phone. For example, if you have an iPhone, choose the MicroUSB to Lightning cable and plug it into the headset and your iPhone, respectively. You’ll get a prompt on your phone asking if you want to give the headset access to it. Once this is done, unplug it from the headset, and place the phone into the tray (which opens up). Make sure the screen is facing away from you, where there’s a gap in the tray. Close the tray, and insert it back into the headset. Connect the cable back to the headset. Now put the headset on. The strap is secured via Velcro on the left and right edges — you can loosen them or tighten them. The headset is comfortable, but it’s heavy — it may get tiring after playing for a prolonged period of time. Look at the tracking beacon. You should be able to see a prompt asking if you want to launch “Lightsaber Versus Mode,” a new game mode that lets you duel another person that owns the Mirage headset and lightsaber. If you look above, you should be able to see a galaxy. Click it, and then you’ll see a Holocron, which looks like a cube. The Archivist, a new character in the Star Wars universe, will pop up and introduce you to the game. The idea is simple: The Archivist is training you to master Jedi challenges, which is a good explanation for why everything looks like holograms. The setup process is complicated, and it can be a little annoying. The app does a good job of taking you through it, but the idea of pulling out a tray and putting your phone in it, then plugging your phone into the headset with the right cable, makes the whole thing feel like a prototype — it should be simpler. Perhaps Disney and Lenovo really want you to feel like a scrappy rebel. Speaking of rebels, the Mirage AR headset looks like a helmet you’d find the rebels wearing, except a little too polished. The strap sits on top of your head and around, keeping the headset secure. On the top right side, there are three buttons for controls. While it may look like a completely enclosed virtual reality headset, the Mirage AR actually has a transparent display, which is where the gameplay is projected. This means you’ll be able to see the real-world environment while engaging in the Jedi challenges. You can move the lightsaber around to deflect attacks, or assail your enemies. The tracking beacon is placed on the floor, and it keeps the experience stable, helping the fisheye cameras on the headset track the player’s movement. There’s no fake blade attached to the lightsaber controller, but when you’re engaged in a Jedi challenge, you’ll see the beam light up on the headset’s display. You can move the lightsaber around to deflect attacks, or assail your enemies. Haptic feedback in the hilt makes it all feel more convincing, while the AR graphics are rendered in a ghostly blue that should be familiar to Star Wars fans. We didn’t have any connectivity issues between the phone and the beacon or lightsaber, even after stopping and coming back later. We did note that notifications sometimes appeared on the screen when the phone was in our headset, and it can block your view of what’s happening. You may want to make sure you go into Do Not Disturb mode on your phone. The latest addition to Star Wars: Jedi Challenges is Lightsaber Versus Mode, which adds a multiplayer component. It’s understandably the most requested feature from people who own the headset, according to Disney. It’s available as a free update now on Android and iOS, but you’ll need to know someone else with the full kit (headset, lightsaber, and beacon) to be able to utilize this game mode — it’s not online multiplayer, it’s local. Both players will need to be on the same Wi-Fi network for this to work, and you’ll need to place both base stations on the ground, and three feet apart — one lights up pink and the other blue. 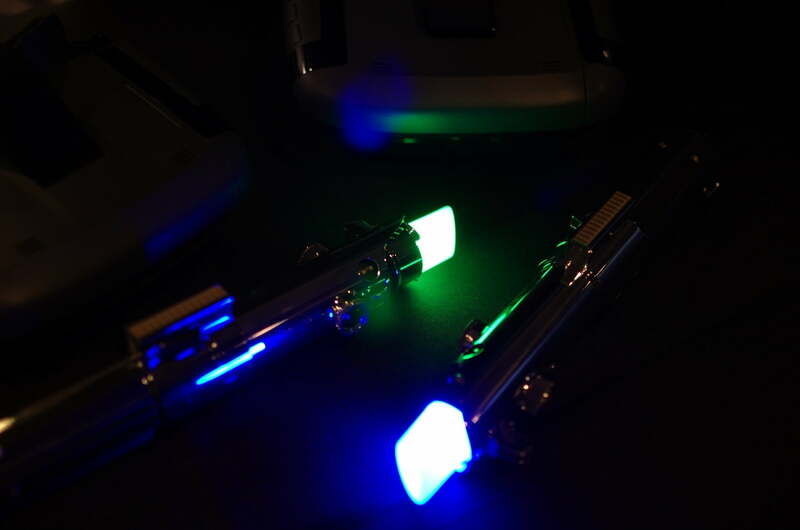 When you start, the lightsaber tips also change colors: One becomes blue, and the other red. Sadly, there’s no red color option yet in case you wanted to try your hand at the dark side. You may be disappointed to learn that Lightsaber Versus Mode doesn’t actually offer any open combat — you can’t just flail your lightsaber around and try to hit your opponent. You’ll get prompts to hit the enemy in specific locations, and you’ll also get alerts to block attacks, and even duck or step out of the way to dodge. It’s a fight that’s completely choreographed, but the move-sets are completely randomized with each duel, so it should feel different every time you play. Disney told Digital Trends it originally tested an open-combat mode, where the fight was entirely left to the two duelists, but the company said it was easy to stand in place and simply wobble the lightsaber around without much effort. It certainly wouldn’t feel like a proper, dramatic Jedi battle. In a demo set up by Disney, we challenged a human player. You should definitely play a few duels in the Lightsaber Battles mode to warm up before jumping into Lightsaber Versus Mode — it can get a little hard. You just have to follow the prompts, but things start to move faster the longer the fight plays out. Miss a block, and the screen flashes red to indicate you’ve taken a hit. Enough hits, and you’ve lost. We quickly assumed defeat to our challenger. It’s a lot of fun, and it gets you physically moving around, dodging and ducking. This certainly may become one of our favorite game modes in Star Wars: Jedi Challenges. The downside is finding someone else to challenge with the headset. While we thoroughly enjoyed the demo, we received two units to test the game mode a little more at our offices. After setting both headsets up, we tried to launch the new multiplayer mode, but we couldn’t get past the “Searching for players” screen. We’re not quite sure why, and we’ve reached out to Lenovo for comment. We’ll do a few more tests in the next few days to see if we can get it to work. In any case, if the demo was any indication, fans of Star Wars: Jedi Challenges will easily enjoy the new game mode. Now if only you could have a red lightsaber … . In solo mode, the challenges are ranked through multiple levels. You start out on the Outer Rim, and progress toward the Core. You have to fight the Archivist, your mentor, when you reach the Core. We’ve yet to defeat her, if that’s a good indication of tough it is. Each level is based on a planet — so for the Outer Rim, you’ll be training in Naboo. You can choose from three game modes when you put on the headset. We went straight to the Lightsaber Battles. It’s the game mode we’ve all wanted to play ever since we saw the first lightsaber duel in “Star Wars: Episode IV — A New Hope.’ There’s also Holochess, which lets you strategically control creatures from the Star Wars lore to defeat enemies; and there’s a Strategic Combat, a tower defense-like game. Flashes warn you when you need to block an attack, and offer suggestions for when you should strike, which makes the game rather simple. It progressively gets harder though, and ultimately your success boils down to your mastery of hand-eye coordination. Fighting felt accurate in most cases, though there wereoccasional moments when the beam didn’t quite match where the physical lightsaber controller was, which obviously broke the immersion. You can easily tap on a button on the lightsaber to correct it. It can get repetitive, but we didn’t find it any less fun. The different lightsaber-wielding enemies you fight have varying fighting styles, which helps to keep things fresh. We never had an issue with the graphics. Kylo Ren, Darth Maul, stormtroopers, and animations looked surprisingly great, and we didn’t find the gameplay to be glitchy or janky; it was fluid. Our only major issue lies with the headset’s field of view. It needs to be wider, because it’s tough to see a full character standing in front of you. We found ourselves quickly having to look around all around the place just to make sure we saw every attack we needed to block, or blaster we needed to deflect. Strategic Combat might sound simple, but we failed on the third tier in Naboo. You get a wide variety of characters and units to place on your side of the battlefield, from Obi-Wan to a rocket turret, as enemies approach. It’s not necessarily just about obliterating the enemy, sometimes you have objectives to protect ships and droids. You have to make sure you’re keeping an eye on all parts of the battlefield — which is why you may want to make sure you’re in a large enough open space. The lightsaber controller is what you use to choose and place units, and things can quickly get serious — we’ve had a few close saves (thanks Obi-Wan). The more you play, the different types of units you unlock. It’s a fun and satisfying game when you win. Holochess, which mimics a game played between Chewbacca and R2-D2 in the original movie, was our least favorite, as it quickly got a little boring. You use holographic aliens to gain more territory, and control over the board. Like Strategic Combat, you’ll need to pay close attention to the amount of damage some monsters can do, but that seems to be all there is to it. After Star Wars: The Last Jedi hit theaters in 2017, Lenovo and Disney added new content tied to the new movie. The expansion brought a new planet called Crait for Strategic Combat — it’s the planet the rebels flee to toward the end of the movie — and you can dual two elite Praetorian Guards in Lightsaber Duel. Lightsaber Battles has new levels and enemies from the film, such as the First Order Stormtrooper Executioner, and Riot Control Stormtrooper. Star Wars: Jedi Challenges is available for purchase for $200. Lenovo offers a standard limited warranty, meaning everything in the box is protected from manufacturing defects up to a year from the date of purchase. Star Wars: Jedi Challenges is a fun, casual way for Star Wars fans and kids to stay engaged as they wait for the next film installment. Gameplay can get repetitive, but Disney has done a fantastic job adding new content, and all the game modes hold a decent amount of replay value. No. If you’re a Star Wars fan and you’ve always wanted to wield a lightsaber, this is your closest bet to becoming a Jedi. The build quality is high, so unless you frequently drop the headset, we think this headset will continue to work for about two years or more. Disney has continued to add content, and it will likely continue to do so until Episode 9 comes out in 2019. Yes, if you’re a Star Wars fanatic, this is an experience you may not want to miss. Updated on May 4, 2018: We’ve added details about a new multiplayer game mode called Lightsaber Versus Mode.